health, in financial difficulty and was selling his art to pay debts. The Cincinnati Historical Society Bulletin, Vol. 37, Summer 1979, No. 2, (Eden Park, Cincinnati, Ohio, 1979), p. 142. It was assumed by all parties including the dealer (Closson), the interior designer and the private owner that the painting was created by C. T. Webber, because this is the name signed on the painting. The private owner purchased it along with three other pictures in 1905. The four pictures have hung as a decorative group since that time, being passed down from one generation to the next. "'Sometimes I sell certain esquisses a little more cheaply, but only to friends and artists.' ...Monet felt that such paintings had qualities, which made them particularly suitable for fellow artists and for the converted, but that they would do his reputation no good, if put on the open market." The 1891 letter shows, he continued on occasion to see or given such esquisses to artist or friends. 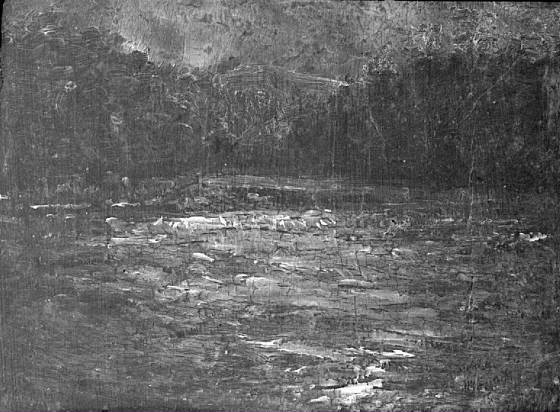 (30 June 1891, W letter 1116, 650) John House, Monet Nature into Art, (Yale UP, New Haven and London, 1986) p. 159. Esquisses defined: The first sketch of a picture or model of a statue. Webber exhibited at the Paris Salon in 1881 and 1888. He was a realist painting portraits and historical landscapes. Mary Syre Haverstock, Artists in Ohio 1787-1900, A Biographical Dictionary, p. 916-917 (Kent State UP, 2000) Webber in Paris in 1888, exhibited Paris Salon. Butler became Monet’s son-in-law in 1892 after Carroll Beckwith (1852-1917, Columbus, Ohio) vouched for Butler's respectability. Charles Merritt Mount, Monet, A Biography, (NY, Simons & Schuster, 1966) p. 347. C. T. Webber signed the study so it could return with him to America which avoided the tariff duty. He was known not only for his art, but also for the academic work organizing Ohio art associations and educating art students. The picture was exhibited by Webber for academic purposes with no intent of selling. During this era many art associations were created and dissolved. The art exhibited by the instructor or academic institution was seldom accounted for, but would often transfer with the instructor to the next association. The signature and taxation research will expand on this statement. Robert C. Vitz, The Queen of the Arts, (Kent State University Press, 1989), p.160. 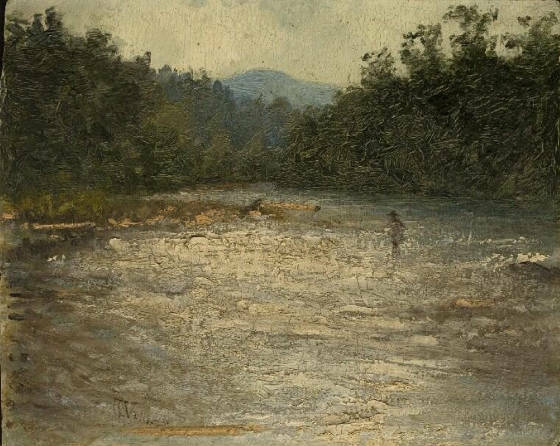 KSH Fine Art acknowledges and thanks Janet Gwendolyn Smith, independent art consultant, for her contributions, including forensic/academic research, travels and expertise in researching the study "Man Fishing". Janet Gwendolyn Smith, ISA a member of the International Society of Appraisers assists fine art owners with their collections. Smith has dedicated the last eight years to art research of the nineteenth century. She is a published author and contributes American artist biographical research for publication on the AskArt website. Forensic digital images and digital x-rays are her expertise. Partnering with the LODOX Corporation, her research utilizes the Statscan x-ray technology to review art throughout the United States. The summer of 2006 the art x-ray research was exhibited on a poster in Osaka, Japan at the International Computer Assisted Radiology and Surgery (CARS) Conference. Smith has reviewed 137 authenticated Monet’s throughout the United States.